Sutherlin, OR — Breeders devote their lives, energy and hopes to producing world-class sport horses that will compete at the top levels of dressage, eventing, jumping and driving. One of the best tools available to help breeders in their quest is the keuring, or inspection, of breeding stock. The 2010 KWPN of North America (Royal Dutch Warmblood Studbook) keurings will take place at 11 locations throughout North America and offer breeders the opportunity to have their bloodstock evaluated, as well as see the results of other breeding programs. The outcome of keurings can increase the value of horses and also provide excellent marketing opportunities. So how can you successfully prepare your horses to receive the best marks from the jury? Several top KWPN-NA breeders share their secrets for making the most of the keuring experience. The results of hard work have paid off for Kathy, not only with loads of awards and recognition, but also as a marketing tactic. “[Keurings] have helped me get my young horses sold,” she emphasizes. In the under saddle portion of the keuring, Martha wants her dressage horses to be developed enough to be properly balanced with swing through the back, forward and not on the forehand. Rather than rush her horses she prefers to wait until they are four to five years old to present them at the keurings. The 2010 KWPN-NA keuring tour is from August 31 through September 13. Bart Henstra and Toine Hoefs will be the inspectors. Bart has been a KWPN jury member since 2003. His Stal Hentstra is a breeding and training facility, which produces 10-12 foals for both dressage and jumping each year. Bart is also an active dressage competitor at the ZZ (Grand Prix) level. Toine Hoefs is an internationally recognized sport horse expert. He has been a licensed KWPN breed judge and inspector for more than 15 years. He has judged at some of the world’s most prestigious shows, including the Pavo Cup and Dressage at Devon. Toine has extraordinary talent for spotting gifted foals and youngsters, such as the approved stallions Juventus, Uptown, Washington and Adamo, as well as competition horses, including Sagacious. The KWPN-NA keurings offer inspections for both young and mature horses. Foals are examined for correct movement, conformation and type. The jury comments on each foal, making the process educational not only for the owner or breeder, but also for spectators. Mature horses are evaluated on conformation, movement and jumping (if applicable for their type) are assessed in-hand and moving freely. A variety of under saddle and driving classes are also offered. 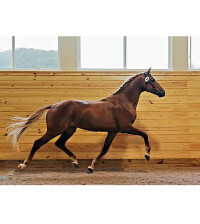 Horses are able to advance to the studbook, earn predicates and generally strut their stuff. For breeders seeing a healthy foal awarded first premium status grow into a useful and successful riding or driving horse is reward enough. However, now breeders will also receive recognition and prizes from the new KWPN-NA Breeder’s Achievement Awards sponsored by Rabobank. Breeders can earn points as their foals receive first premiums and their older horses earn their predicates, including star, crown and preferent. Silver, Gold and Platinum level awards can be earned. Complete details about the KWPN-NA Breeder’s Achievement Awards and keurings can be found at www.kwpn-na.org. In 1983, the Dutch Warmblood Studbook in North America was established as the North American Department of the Royal Warmblood Studbook of the Netherlands (KWPN) in order to promote breeding and enjoyment of the KWPN horse in North America. To learn more about KWPN-NA membership, stallions and breeding, visit www.kwpn-na.org.